The benefits of Coconut Oil. The hair benefits of Coconut Oil! So for the last few months, I have tried to find a solution. A product that would work out cheap, but create many different beauty treatments in one go. After crazy amounts of Google research, I realised that Coconut has always been boasted about. This is when I came across Coconut Oil. Coconut Oil is healthy for both inside and outside your body. I thought id give Coconut Oil a try, so I bought a 200ml bottle of Coconut Oil off Ebay. Within a few days, it arrived so I thought I would give it a go straight away, so far I have kept this as a hair care routine. 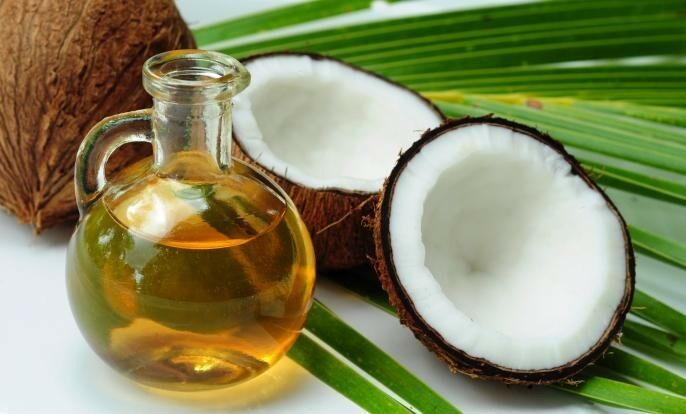 There's unique fatty acids within Coconut Oil. It has a small molecular structure so it passes freely into the hair's cell membrane, allowing for the oil to penetrate the hair's shaft; this allows it to bring out the deep conditioning from within as opposed to other conditioners that work from the outside in. For a deep condition, massage your hair with Coconut Oil once a week, leave it in for 2/3 hours then wash out with shampoo. When you get to the conditioner part, simply dab on conditioner at the ends of your hair and wash off two minutes later. Dry like normal (don't forget your heat spray!) Then wollah, soft, shiny and deep conditioned hair! As I previously mentioned Coconut Oil is a good health factor for both inside and outside your body. Have you got any self made beauty regimes you use? I've never used coconut oil but it sounds so beneficial! coconut oil is my utmost favourite oil EVER! its one of the few oils that keeps its goodness regardless of extraction processes. I love coconut oil! I use it as a body moisturizer and it works great especially during the winter months. Thanks for sharing!